Two of baseball's perennial underdogs - the Kansas City Royals and the New York Mets - will go head-to-head in this year's World Series, which starts on Tuesday. The Royals are appearing in their second straight Fall Classic. Last year they confounded all expectations by making the World Series, only to lose in the deciding seventh game to the San Francisco Giants. The team had been consistently one of the worst in baseball, and nobody had expected them to do well. But it has been a different story in 2015. They dominated their division - the American League Central - finishing 12 games ahead of second-placed Minnesota Twins. On paper there is nothing small time about the New York Mets - they come from the Big Apple after all. They have never been short of resources - or celebrity fans including actor Matt Dillon, comedians Jon Stewart and Chris Rock and singer Nicki Minaj. But it has been their misfortune to live in the constant shadow of their neighbours across the East River, the Yankees, baseball's most glamorous and successful team, who have won the World Series no fewer than 27 times. The Mets were formed in 1962 to meet demand for a second Major League franchise in a city still traumatised by the controversial departure of two of its beloved teams, the New York Giants to San Francisco and the Brooklyn Dodgers to Los Angeles. They promptly posted the worst regular season record in modern times, and were thought of as a rather embarrassing joke. But they amazed the baseball world in 1969 by winning the World Series, being dubbed the Miracle Mets. Success since has been sporadic. A second World Series title followed in 1986, when, seemingly down and out against the Boston Red Sox they were handed a lifeline by the unfortunate Bill Buckner, who allowed a routine ground ball to bobble between his legs in what is arguably the most infamous error in the history of baseball. The Mets made the World Series again in 2000, but to underline their status as the second team in New York, they lost 4-1 to the Yankees. Since then there has been much hope of success, but nothing tangible, as their division - the National League East - has been dominated first by the Atlanta Braves and then the Philadelphia Phillies. The team have a history of signing up big-name players, only to see them under-perform. But success in 2015 has not been built on big-money marquee signings, but by a tight-knit roster of home-grown talent. The Mets used 26 home-grown players during the regular season, second in the majors only to San Francisco. 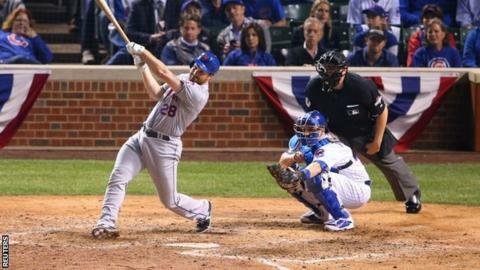 Those players include all-star third baseman David Wright and utility infielder Daniel Murphy, who became the first player to hit home runs in six consecutive play-off games. Perhaps most remarkably, a quartet of young pitchers - Jacob deGrom, Matt Harvey, Noah Syndergaard and Steven Matz - all of whom have only ever played in the majors for the Mets - have excelled and will all feature prominently in the World Series. Kansas City, too, has made developing home-grown talent a priority, with the team's "farm system" widely praised as one of the finest in baseball, and responsible for stars such as first baseman Eric Hosmer, third baseman Mike Moustakas, and pitchers Kelvin Herrera and Yordano Ventura. It won't be a familiar name on the World Series pennant this year - but it will represent a rebuke to those who argue that only big bucks can breed sporting success.